Scroll down to see our selection of Grab Bars for sale. 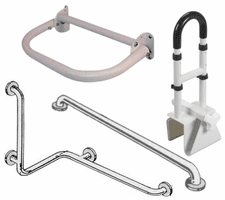 Grab bars are used widely in hospitals, clinics, public restrooms, and facilities. We carry a large selection of grab bars including straight grab bars, corner grab bars, floor and wall mount grab bars, suction cup grab bars, and clamp on grab bars. Grab bars are safety devices designed to enable a person to maintain balance, lessen fatigue while standing, hold some of their weight while maneuvering, or have something to grab onto in case of a slip or fall. Grab bars can also be used to assist care givers in transferring patients from one place to another. Grab bars also help individuals that have difficulty sitting down, have balance problems while seated or need help rising from a seated position. When used in a shower or bathtub grab bars help while transferring in and out of the enclosure, and generally helps to prevent slips and falls. .